This is a relatively new segment to my blog whereby I will try to fill you in on some of the latest foodie places I've tried. So first up is Granger and Co. I first tried their food when I was home in London back in 2015 and it was one of the first places I went back to when I arrived back in London last month. Granger and Co happen to have really unique menu. There are now branches across London but I went to the one in Westbourne Grove. One of my favourite things about granger and co is the fact that there are no reservations. Sure it means we must wait a lifetime for a table but I like the element of equality it promotes. My friend and I went for the soft shell crab and kimchi fried rice, which was so delicious is deserves to have a trip to Korea so the locals can try this masterpiece. Kimchi friend rice is famous for having a meat element which is usually filled by the use of spam, which I am not a fan of, however, the chefs put their own twist on it and used chorizo! Chorizo, soft shell crab and a perfectly poached egg made for a winning combination. The other dish featured was a Burrata and lentil dish to which we added chicken. It was heavenly, served with a lemon for extra flavouring. It was very filling due to the lentil and we definitely were stuffed up on food and cocktails. I don't think I took a picture of my cocktail but it was glorious. We also had coffees. It didn't break the bank and the food was fantastic. A highly recommended Sunday lunch! 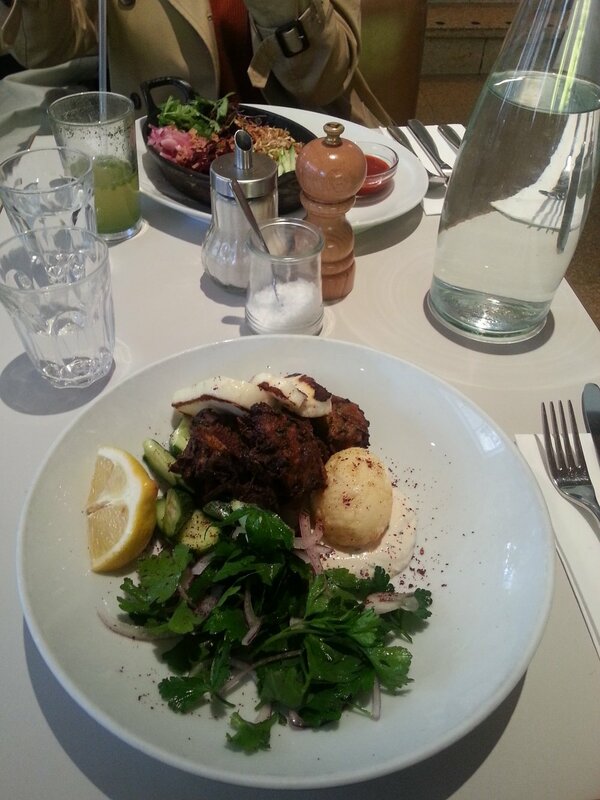 And a bonus from when I was last in London of a wonderfully tasty halloumi and falafel salad. Long live Granger & Co.